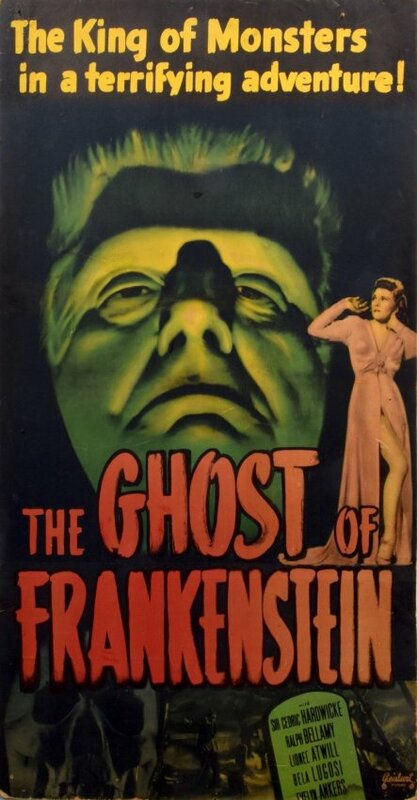 March 1942 saw another instalment in the revival of one of Universal’s celebrated icons with the release of The Ghost of Frankenstein. 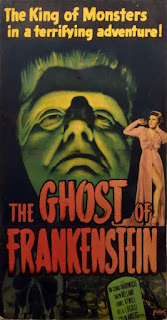 By now there was a growing lack to the lustre and although some of the welcome ingredients were still in evidence, the franchise’s new downgrading to B-movie status could be detected on screen. Ghost was the third sequel to the original, which meant that each film’s seemingly definitive end had to be staved off with increasing implausibility. 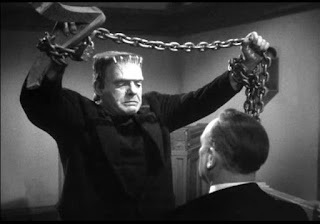 After bringing the house down twice around his ears in the first two films and then falling to the presumed no-way-back demise of a molten hot sulphur pool at the end of Son of Frankenstein (1939), how was the studio going to reactivate the Monster once more? And who would be the catalyst since both the original creator Henry and his son Wolf were dead and Ygor had been shot to death at the end of Son? Scott Darling and Eric Taylor - who wrote the Lugosi horrors Black Friday (1941) and The Black Cat (1940) – came up with a cunning solution that returned both the Hungarian star and Creature. By having the time-honoured wrathful villagers of Frankenstein town blow up the castle to hopefully erase the curse befalling their prosperity, they unwittingly shatter the sulphur encased around the Monster. Ygor’s survival is simply attributed to only wounding after being riddled with bullets. (This argues his desire in this film for immortality as unnecessary since he’s clearly as indestructible as his mute hulk pal). Erle C Kenton, last seen in the genre directing 1932’s Island of Lost Souls (see my review of 6/4/2016) keeps a crisp pace however across the improbable expositions. The screenplay asks us to swallow the further revelation that Henry had not only one son but two, Ludwig, proving that scientific pioneering truly is a Frankenstein family business. In the role is Sir Cedric Hardwicke who continued to balance his illustrious stage career with film roles including Universal horror that benefitted from his grave solemnity. The only wrinkle in his choice for me is that his persona carries the feeling of the family curse weighing on him from the start, though you could fancifully justify this as a shared genetic tendency for the morbid if you like. Supporting Hardwicke in the operating theatre, as Ludwig’s actual mentor is Lionel Atwill’s Dr Boehmer. Atwill was enjoying a brief respite from his literal trials with a busy year, and here is essentially the white-smocked experimenting madman we’d just seen in the previous week’s release of The Mad Doctor of Market Street. (In fact there is a later shot of him looming toward our point-of-view, as Ygor, with a chloroform swab that copies the exact same image from that film). Boris Karloff had understandably escaped from the binding shackles of playing the Monster after three films. The lengthy multi-hour burden of daily make-ups had been punishing enough on top of the psychologically wearisome task of re-generating enthusiasm for a series he shrewdly foresaw as diminishing in quality over time. He would come back as Doctor Niemann for House of Frankenstein (1944) but for now Universal had the perfect actor to lumber forth as a replacement: Lon Chaney (Jr). As a younger man and hungry to capitalise on his success in 1941’s The Wolf Man, Chaney was in many ways a good fit as the Monster. Though he lacked Karloff’s expressive range, one plus point he had over the urbane Englishman was a larger, more imposing physicality that wouldn’t need quite so much bulking out. Chaney did feel the constraint of typecasting yet he was glad to build on his marquee value and suffered the time-consuming though high-quality sessions with Jack Pierce that created his facial similarity to Karloff’s Monster. Some continuity was kept for his creation in that he was prevented from speaking till the climax as we shall see. 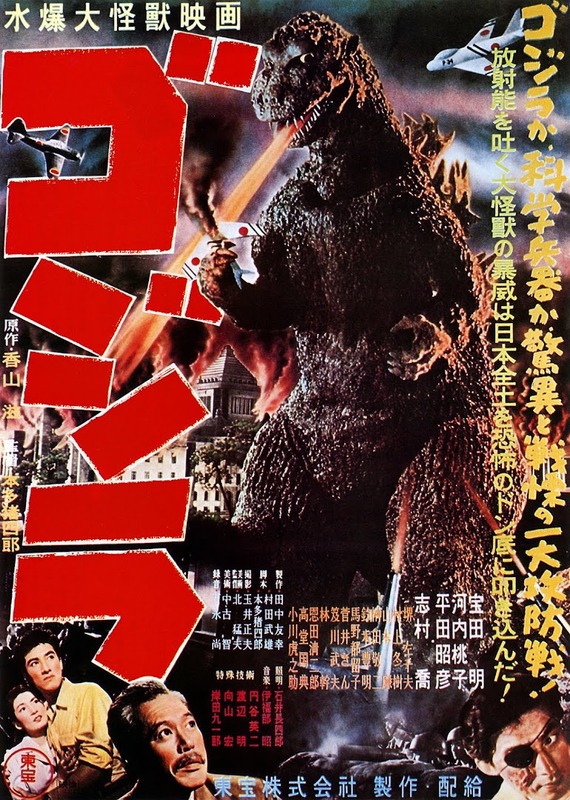 The downside is that the writers fashioned a screenplay that also constricts the Monster’s physical intimidation somewhat. Each time he threatens to run amok he is pacified, mainly by the innocence of the charming little girl Cloestine Hussman (Janet Ann Gallow). There is also a trial scene in which he is an enormously incongruous defendant manacled to the stand while local lawyer Ralph Bellamy handles his case. On that point, Bellamy is as usual a class addition to a cast who embodies wholesome decency (and a little romance with Evelyn Ankers as Ludwig’s daughter Elsa), yet he is also a slightly awkward stand-out of modernity against the quaint Ruritanian setting of these movies. Nevertheless, there is plenty to enjoy in Ghost. Lugosi is in many ways still the heart of the sequels he appears in as Ygor and has lost none of his poignancy. His eyes shine out from his bearded, crook-necked head, alternating between sinister delight at his secret machinations to be brain-swapped with the Monster and a hurt vulnerability. It is no wonder he cleaves so close to the Creature; they are soul-brothers of misunderstood victimhood. Although Ygor has a past grave-robber conviction, like the Monster he has been abused instead of redeemed into a survivalism bordering on evil. Ludwig has enough moral fibre like his brother Wolf to initially shun his devilish inheritance - until the Hamlet-like spectre of their father haunts him, here played again by Hardwicke with a sleeker bespectacled look. But this is more a temptation to the dark side than an exhortation to avenge it in his family. The floating ghost of Henry persuades him that instead of dissecting their ghoulish offspring, he can correct the previous errors: “What if I had another brain?” Fans of the series will already recognise this familial sales tactic - the inexorable call of his blood-line as much as his scientific curiosity, one that Mel Brooks and Gene Wilder recognised so beautifully in their spoof Young Frankenstein (1974). Caveat emptor be damned as indeed will Ludwig be. Feverishly he dusts off dad’s diabolical diary and sets to work involving the delighted Boehmer in what will be the world’s first human brain transplant. He intends to use the brain of his assistant Kettering (Barton Yarborough), who was a fine upstanding soul - until rendered horizontal by the berserk rage of the Monster. Ygor of course campaigns to provide the donor brain instead as a poetic way to be fully reunited with his friend (in a secretly-coveted immortality) and be freed from his damaged body. Ludwig at least has enough virtue and judgement of Ygor’s motives to nix such a risky operation – “You think I’d put your sly and sinister brain into a giant?” Boehmer has no such qualms and in a bid for his own longevity of reputation cracks open Ygor’s cranium, unbeknownst to Ludwig. Climactically there is the traditional vigilante march on Ludwig’s chateau by the torch-wielding mob. Bellamy then rides in on horseback, virtually heading them off at the pass western-style in another odd burst of incongruity. He beseeches the baying crowd’s patience long enough to go in and investigate. 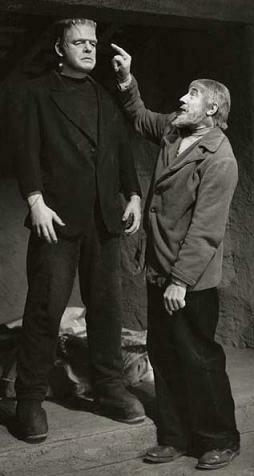 “I need you to be frank”, he warns Dr Frank. Ludwig assures him that the Monster is a new house-trained version powered by Kettering grey matter. 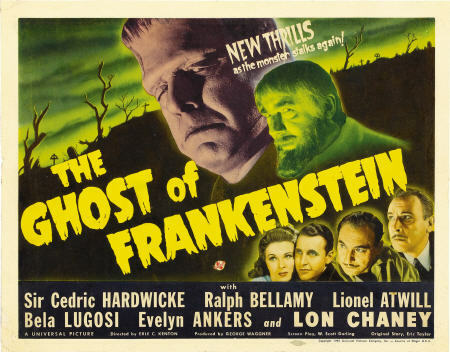 To his horror, what comes out of the Creature’s mouth is not the reasonable tone of his employee, but the triumphant rasp of Lugosi’s voice (dubbed over Chaney): “You are Dr Frankenstein!” It is a ludicrous yet great moment with enough shock value to earn Ghost its place in the franchise. For what it’s worth to Ludwig’s conscience, the Creature’s body-swap is short-lived and Boehmer’s trickery results in an ironic payback. On discovering he is blind due to being a non-matched blood-type, the Monster hurls him against the control board, frying Boehmer to death upon the same energy source that rejuvenates him. Once again, the chateau as the film’s House of Horrors is consumed in flames. Our last glimpse of Chaney sees him crushed under a falling rafter in flames. I am addicted to these movies, love em!